Extending from the Foramen Magnum to the upper border of the pons, the Medulla Oblongata is the direct upward continuation of the spinal cord, where It creates the lowest part of the Brainstem and is located nearly vertically in the anterior part of the posterior cranial fossa between the Clivus (Superior Surface of The Basiocciput) in front and the Vallecula of the cerebellum behind medulla, gives connection to the past 4 cranial nerves. The lower part of the medulla, such as the spinal cord, includes the central canal. In the upper part of the medulla, this canal widens and moves dorsally to create the lower part of the 4th ventricle. Therefore, the medulla is split into 2 parts: a lower closed part of medulla and an upper open part. 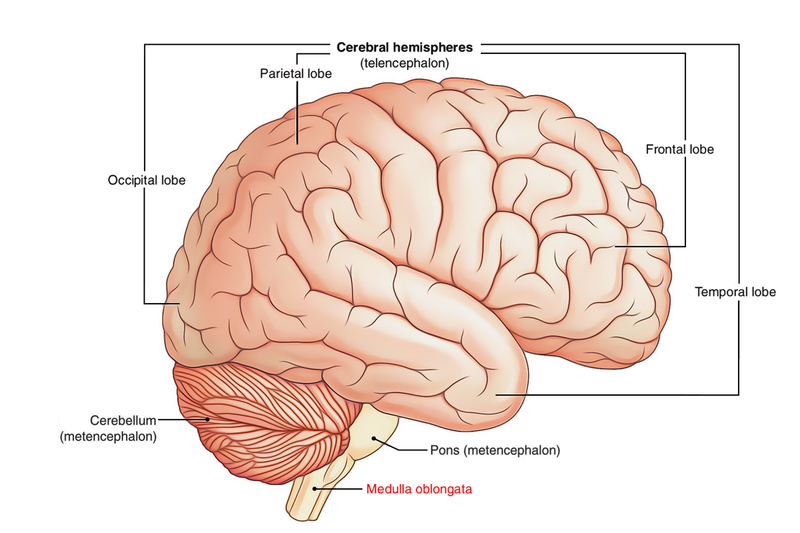 The pons is a bulky broad transverse mass of the brainstem between the midbrain and medulla. On each side, the pons is constant as the middle cerebellar peduncle, thereby creating a bridge between the 2 cerebellar hemispheres, thus its name pons (L. pons = bridge). 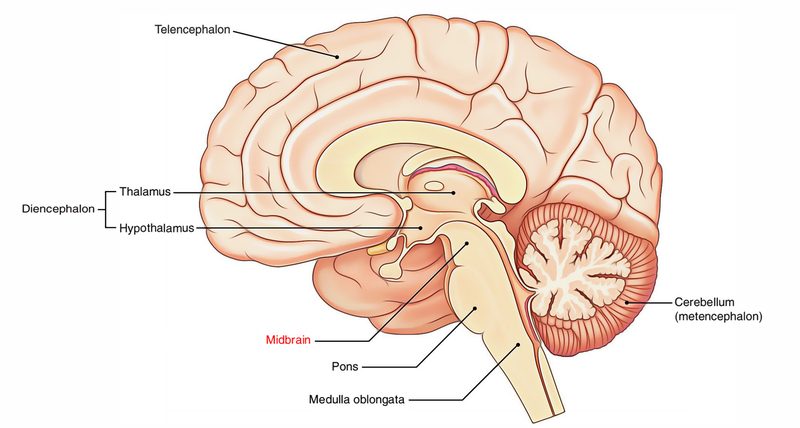 The midbrain is the smallest section of the brainstem. It’s just above the pons and includes the nuclei of the 3rd (oculomotor), 4th (trochlear) and 5th (trigeminal) cranial nerves. The midbrain is traversed by the cerebral aqueduct. The part dorsal to the aqueduct is termed the tectum and is composed of 4 surface levels-the corpora quadrigemina (consisting of 2 superior and 2 inferior colliculi). The superior and inferior colliculi get visual and auditory nerve impulses, respectively and are concerned with reflexes calling for these senses. The part ventral to the aqueduct is split into left and right halves, the cerebral peduncles. Every cerebral peduncle is made up of central part, the tegmentum that is divided ventrally from the crus cerebri by a mass of pigmented grey matter, the substantia nigra. The crus cerebri continues ipsilaterally with the internal capsule above and includes descending fibres from the cerebral cortex to the brainstem and spinal cord. The space between the 2 crura is referred to as the interpeduncular fossa. The tegmentum mainly includes ascending tracts from the spinal cord to the thalamus and includes 2 large cigar shaped nuclei termed red nuclei. In cross section, the reddish nuclei appear as oval masses of the pinkish grey matter. The reddish nuclei help in unconscious management and coordination of motor actions. The brain and spinal cord grow from the neural tube. The cranial end of the neural tube creates the brain, while the caudal end creates the spinal cord. 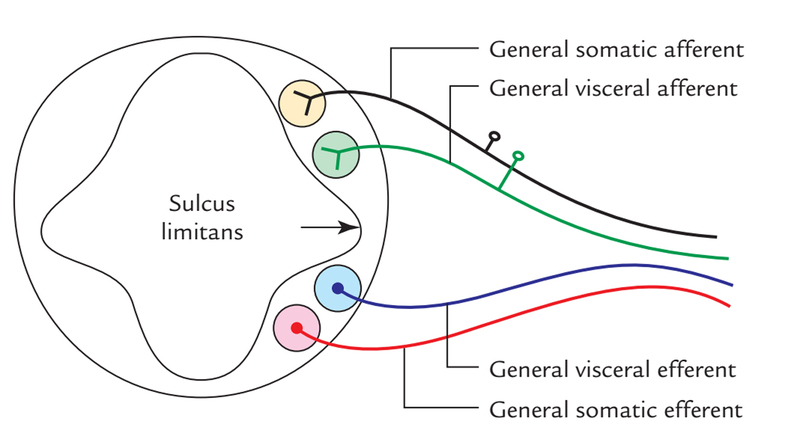 The nerve cells in the wall of the neural tube order themselves into functional groups. In cross section, the central canal project laterally into a groove on the inner wall of the spinal cord as sulcus limitans and splits the wall of the spinal cord on every side into 2 parts: dorsal and ventral laminae. The dorsal and ventral laminae are also often referred to as alar and basal laminae, respectively. The alar lamina is made of sensory cells and basal lamina is composed of motor cells. The cells in every lamina are ordered into 2 columns: the 1 near the sulcus limitans, concerned with the innervation of viscera, is termed the visceral column and the 1 far from sulcus limitans, concerned with innervation of somatic structures, is known as the somatic column. There’s a quite similar arrangement in the brainstem, but here a third type of cell column appears in every lamina between the visceral and somatic column to innervate the derivatives of pharyngeal arches. This column is referred to as the unique visceral column. As the development proceeds, every column identifies into 2 or more distinct cranial nerve nuclei. Anterior and posterior spinal arteries. Anterior and posterior inferior cerebellar arteries. The reticular formation is a diffuse ill-defined mass of nerve cell clusters and interlacing nerve fibres inhabiting the whole core of the brainstem. Phylogenetically, it composes the old reticular core of the brain and includes inside it the ‘vital centers ‘. Reticular formation stretches cranially to the diencephalon and caudally to the spinal cord. The reticular formation gets info from the majority of the sensory systems of the body and relay them to all the levels of the neuraxis. It’s essential for the maintenance of sleepwake cycle, level of consciousness and alertness or mutism. In spite of the fact that reticular formation is defined as a network of nerve fibres intermingled with nerve cells, on careful evaluation it shows pretty localized cell groups termed reticular nuclei in some specific regions. The reticular pathways are polysynaptic, both ascending and descending and crossed and uncrossed. Consequently, unilateral stimulus generates bilateral reactions. Functionally, the reticular formation is split into sub-groups, viz., Ascending reticular activating system (ARAS), Descending reticular system (DRS). The ARAS is considered to cause the maintenance of alertness and consciousness of the brain. It’s usually named merely a reticular activity system (RAS) by clinicians. The DRS is composed of descending pathways to autonomic centers of the brainstem and plays a crucial function in controlling the functions of the essential centers, viz. respiratory center, cardiac center and vasomotor center. Contralateral loss of pain and temperature sense in the trunk and limbs, as a result of participation of spinothalamic tract. Ipsilateral loss of pain and temperature sense over the face, because of participation of the spinal nucleus and tract of the trigeminal nerve. Ipsilateral paralysis of muscles of palate, pharynx and larynx, because of engagement of nucleus ambiguus. Ipsilateral ataxia, because of engagement of inferior cerebel-lar peduncle and cerebellum. Giddiness, because of engagement of vestibular nuclei. Contralateral hemiplegia/paralysis of arm and leg, as a result of damage of pyramid. Ipsilateral paralysis and atrophy of the half of the tongue, as a result of damage of hypoglossal nerve. Contralateral loss of position and vibration perception because of damage of medial lemniscus. The visual and acoustic stimulation can excite the reticular activating system and so keep alertness and focus. Because of this, the stimulation like sound of ring alarm clock or surprising bright light can arouse consciousness. The slumber is believed to take place because of fall in the action of RAS. A coma is a state of unconsciousness as a result of inactivity of RAS.